After a late start Di, Chris, Matthew and Sophie headed off for Lucerne on the train. 40 Swiss Francs for our tickets (which seems a lot really) and we were off. The train ride took 30 minutes and took us past some breathtaking scenery. We had some lunch, consulted the lady in the tourist information office and set off to cross the covered bridge to get to the old town. It was rather gruelling walking around the streets with two children who are sick of walking around streets unless we stop in a shop to buy something for them. At one point Matthew was whinging that he wanted to go home (to Australia) and two (Australian as it turned out) ladies turned around. I told them we had 3 more weeks. One of them looked pitifully at me and said, “And you’ve got to put up with that for 3 more weeks”. I guess their kids have grown up and they’ve forgotten what they were like or maybe they didn’t venture out when their kids were young. But, nonetheless it sums up the mood we were dealing with. One of the things the tourist lady had suggested was to walk along the city wall and climb 3 of its towers. As soon as there’s a chance to climb something, Chris is in! Fortunately, today once we got to the first tower, Matthew was quite keen too. The steps were quite high and it was challenging for Sophie, and me just quietly, but we made it to the top and were rewarded with a lovely view. After a while more walking we had a mutiny on our hands so we decided to stop in at Starbucks for a drink and a sit. Not very Swiss, I know but it provided the relief we needed for long enough to give us the courage to carry on. Mind you, the one large coffee (Chris), one medium mango frappe (me) and one large strawberry milkshake (Matthew and Sophie sharing) cost $28 Aussie dollars but the sit was worth it. We pulled out the brochures from the lady in the tourist office and showed the kids the one for the Glacier Garden with a Lion monument and the da, da, daa… Hall of Mirrors. The kids remembered their excitement when the lady first told us about this and were keen to walk some more. It was well worth the walk and the 30 Swiss Francs to get in. The mirror maze was fantastic. 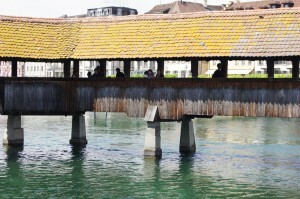 It had been created in 1896 for the Swiss national exhibition in Geneva and has been at the Glacier Garden since 1899. There are 90 mirrors but it felt like there were thousands. It was very cleverly done. Chris walked into a mirror or two along the way, as did Sophie. Matthew had gone way ahead so I don’t know if he did the same but I walked with my arms stretched out either in front or beside me to determine which way to go. There was Indian music playing and Sophie took the opportunity to dance in front of the mirrors giving her many copies of herself to look at from all angles. Matthew was playing a shooting game with his hands up in front of his straight arms and turning quite quickly like a whole swat team reflected in the mirrors. 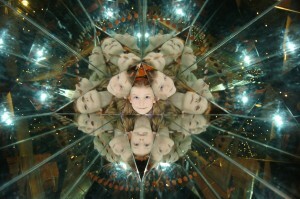 After we finally dragged the kids out of the maze there were a few more mirrors outside that gave distorted reflections. This was fun as well. 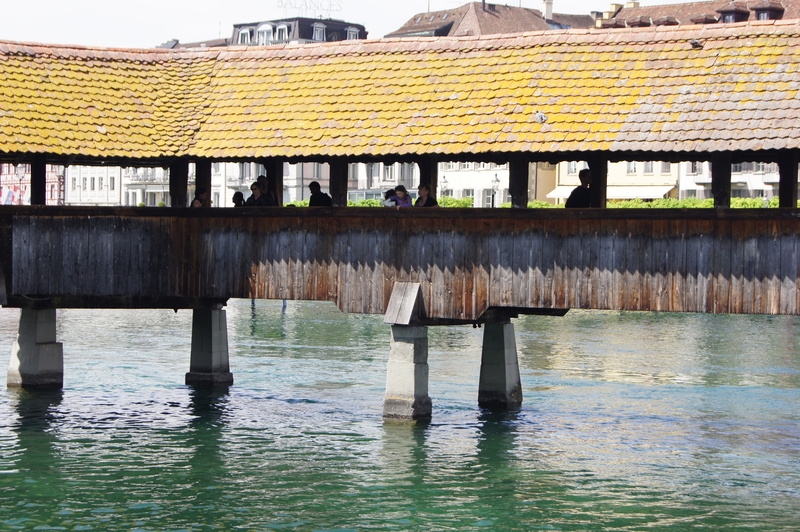 We headed back to Lucerne Station via the Bachmann chocolate shop and headed back to Zug. Paul and Paige met us at the station and we arrived home to the smell of Sheridan’s gourmet dinner. We are being well and truly spoilt here, and loving it!! !